For the purposes of comparison, Student Outcomes in San Juan Unified School District and Catholic School Academic Content Standards are listed at the end. Kindergarten students have their core subjects taught by their classroom teachers. Weekly classroom music, physical education, Spanish, and Suzuki piano lessons are taught by auxiliary teachers. For decades we have been teaching reading through learning phonics. The students read words by sounding out consonant-vowel-consonant words like cat, then they learn the two-vowel rule. This rule is when there are two vowels in a word, then first vowel says its name and the second vowel is silent (for example “cake”). Students apply this rule to both their reading and writing. As their reading progresses, the children are taught to read by sight those words that are exceptions to the phonics rules and patterns. As the students progress through their phonics readers, they are systematically taught the 2-letter combinations that are sounded out by blending the two sounds together. This is introduced in the initial position of the word, as “bl” in block and blade. They progress through 14 other blended sounds; each lesson followed by stories and activity sheets. They’re also taught the 2-letter combinations that make only one sound, for example “ph” makes the same sound as “f”, as in phone. Their work papers include “cut and paste”, riddle, and joke pages, so it is fun for the children to do their schoolwork. Through review and reading practice, each successive skill is mastered and becomes as “automatic as breathing”. These are the foundation-skills that, when mastered, will enable a child to become a top student, not just in the subject of reading but in any subject that requires reading or writing. The students read from 7 sets of phonics readers. Each set of 10 reading books has its own workbook, providing drill and practice in writing the words they are reading. In addition, the children have a phonics workbook that provides additional practice. Four days a week each student takes home the book that he/she read to their teacher, and reads it to their parent, who is required to sign it. El Rancho parents are our reading partners. Spelling tests begin around January. The teacher slowly dictates the words and the children write them without help. Several weeks later, the teacher begins dictating a short sentence and the children write it. Then they draw a picture about the sentence. The children sometimes draw a picture of something else, usually with an explanation like, “I like cats”, or “I hurt my finger”. All illustrations are happily received by their teachers. Students learn to count, recognize, and write numbers 1-100. This includes the before and after concept, as well as skip counting by 2′s, 5′s, and 10′s. Students “play” with manipulatives when introduced to addition and subtraction concepts and gradually learn to write and solve a number sentence. Addition and subtraction facts (1-12) are a breeze by the end of kindergarten! Rulers, moveable clock faces, dominos, and real coins are some of the hands-on tools that make math fun! The children love learning about shapes, patterns, fractions, graphing, calendar, money, time and measurement. As the year progresses, the children begin to solve story problems and are challenged with two-digit addition and subtraction. The students learn about each of the major holidays. They hear stories and make art and craft projects associated with them. Guests (often the parents or grandparents of students) speak to the children about their heritage and culture, and involve the children in song and taste-testing ethnic foods. 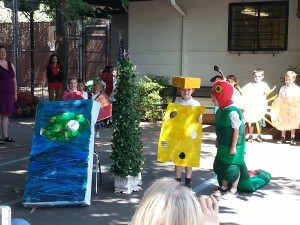 The children learn about the earth. They work with a globe, and learn about the sun, planets, moon and space. They begin learning map skills, and locate states and cities on a map. Science lessons are a time for the children to explore the world around them. The children love to experiment with magnets, sinking and floating objects, the five senses. Other science topics covered in kindergarten include activities that help the children learn about rocks, habitats, planets, the human body, and life cycles. 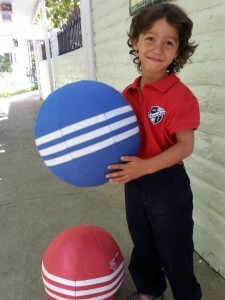 Students look forward each week to P.E., which is taught by an auxiliary teacher. They develop balance, coordination, ball-handling skills, simple sports skills, teamwork, cooperation, and good sportsmanship. In first grade, students may be signed up for basketball practice and play, which is an after-school activity. The students do many art projects associated with the holidays and seasons. They also have instruction in drawing simple objects and animals. They explore art through colored pens, tempera and watercolor paint, 2- and 3- dimensional projects, and other media. They are read stories highlighting the lives and works of Van Gogh, Monet, Mary Cassett, Kandinsky, and others as time permits, and create works of their own in these and other styles of painting. Each week a certified Suzuki Method piano teacher gives small group lessons to the students. Each child has an electronic keyboard. The children learn to repeat a note, a rhythm, and a pattern, and to read simple music notation. The eye-hand coordination and finger dexterity that is developed by these lessons has a direct benefit to the students’ reading and writing skills. 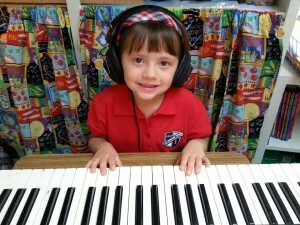 Piano lessons at El Rancho School are a joyful time for the children. In addition to bringing joy into children’s lives, studies have noted a causal relationship between piano lessons and later school achievement. These studies have demonstrated that students who take piano lessons at a young age later experience enhanced math test scores, and to a lesser degree, science scores. These scores do not show a tendency to diminish over time. Additionally, in the Suzuki Method of instruction, students learn to play by hearing and duplicating tones, rhythms, and patterns. This auditory memory training is thought to enhance auditory memory, not just in relation to music, but in other areas as well. The Music Director teaches weekly classroom music. Lessons include tone matching to enhance their singing, using percussion instruments, music theory and singing. Students learn to recognize basic music symbols such as quarter, half and whole notes, and the staff and treble clef. By the end of the school year, student will be able to read simple rhythm and identify notes from the treble staff. The children are taught to sing in a group, and to follow the director as he guides them in common ensemble techniques. They learn a wide variety of songs, including patriotic songs, and seasonal songs associated with Halloween, Easter, and Christmas. They perform their songs at a nearby senior citizen facility and to their families at spring and Christmas concerts They may also be signed up, at additional cost, for a choral class that is taught after school. Beginning in kindergarten or first grade, parents may sign their child up for weekly private piano or other lessons. The children always remember when the Music Director comes to their room, because their lessons are so fun! The students develop vocabulary and learn conversational phrases in twice weekly Spanish lessons. Over 150 puppets are integrated into instruction, in order to capture the interest and enthusiasm of the children. The children enjoy learning songs in Spanish as well as English. The school-wide RAK (Random Acts of Kindness) Program is implemented in Kindergarten. When students are observed, “committing a random act of kindness”, their teachers or parents fill out a RAK coupon, which is sent to the Vice Principal. The Vice-Principal visits the rooms to read, celebrate and reward (from the treasure box) those children whose coupons have been given to her. Additionally, short lessons about virtuous behaviors are discussed in class, and children are gently guided to develop attitudes and habits of honesty, perseverance, tolerance, kindness, responsibility, and gratitude. El Rancho School serves as a partner to the parents in helping children develop ethical and moral attitudes, giving the students a compass to guide their choices and behaviors. If you have questions about these results please contact El Rancho School at 916-482-8656. Come join us at the 4th of July Carmichael parade. we look forward to this annual event. Elementary school joins together monthly to celebrate student achievement and their random acts of kindness. Spirit Rally Day. Vistors are pleasantly surprised by our beautiful and shady play areas. Come tour our campus. 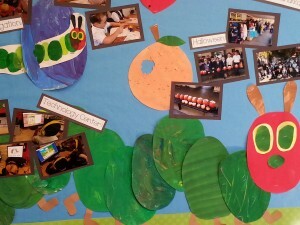 Our preschool students enjoy academic lessons, educational games and hands on lessons. For 3rd - 6th grade students, computer technology is integrated into their daily lessons. They can choose to use either the desktops or tablets.